Eggs are a common grocery staple. Not only are they inexpensive, but they’re high in protein, filled with essential vitamins, and loaded with antioxidants. They’re a perfect way to start your mornings and can even be incorporated into lunch and dinner. But what happens when you get sick of your run-of-the-mill omelettes and sunny side ups? Figuring out creative ways to eat this health-food staple can be tricky, but lucky for you, I’ve come up with seven healthy and fun ways to switch up how you typically prepare your eggs. A classic Middle Eastern staple known as Shakshuka, eggs baked in tomato sauce, are a delicious and easy way to incorporate eggs without fatty cheeses or refined carbohydrates. 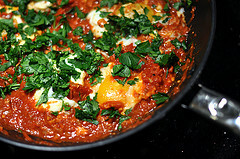 Just plop an egg in tomato sauce and simmer until cooked, adding vegetables, greens, and spices as desired. 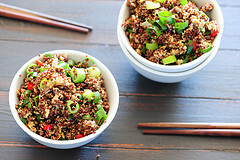 Just as eggs are used in traditional fried rice, you can spruce up your quinoa dishes by taking a healthier twist on an Asian classic. Mix in your favorite vegetables and herbs with your quinoa in a pan, and crack an egg on top, mixing around to cook. This will add protein to your meal without making your egg the main focus of the dish. Feeling lazy? 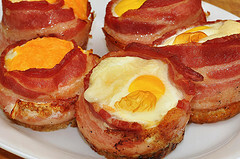 Grease a sheet of muffin molds and crack an egg into each, then bake in the oven. You can get creative with what you put in these cups, using anything from vegetables, to cheese, to potatoes. Switch it up for different nutrients as well as meals that work better for lunch and dinner. Slice an avocado in half, crack an egg in the middle, and cook it in the oven. The warm avocado and egg begin to blend together, creating a rich treat that’s full of healthy fats fiber, and many vitamins. Experiment with toppings for a more versatile and exciting meal. 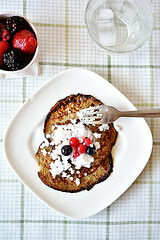 Kick breakfast up a notch with these two-ingredient pancakes. 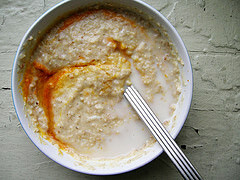 Mash a ripe banana and whisk thoroughly with two eggs. This makes a batter that can be cooked in the pan in minutes, yielding delicious protein-filled pancakes that nix the refined flour and sugar. Cook in some eggs or egg whites into your oatmeal for a balanced meal of protein and carbohydrates in the morning, a surefire way to keep you nourished and satiated throughout the day. Eggs can be added to both savory and sweet bowls, so experiment with different flavors to see how you best like your oats with eggs. 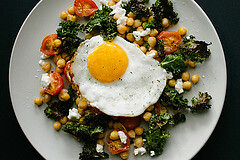 Cobb isn’t the only salad allowed to get a nutritional boost from eggs! Whether it’s hard boiled, poached, fried, or over-easy, try topping your salad creations with an egg, and see how much flavor is added to your dish. You can even experiment with replacing your meat with an egg for a lighter and less-calorie filled lunch or dinner.